In an interdependent world, the UK has to agree the terms on which it interacts with other countries. The more it insists that they must reflect its own preferences, the less scope it leaves for mutually beneficial exchanges. In future trade deals with the EU or other nations, the UK will have to forfeit some capacity to decide the rules it applies to its markets. Since the UK decided in June 2016 to leave the EU, to return power to Westminster from Brussels, its Conservative-led government has struggled to come up with a plan for Brexit. As the UK government has slowly but surely lost its illusions about what it can achieve in negotiations with the EU, voters have changed their tune about Brexit. 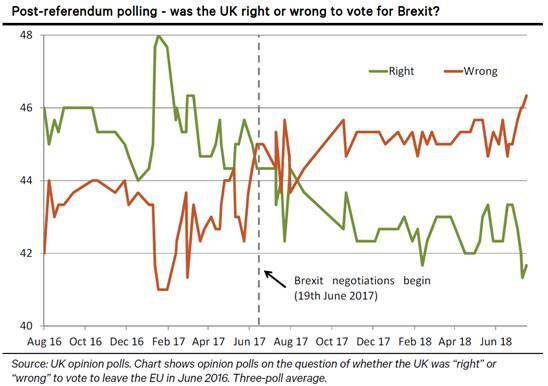 The percentage of voters in favor of Brexit now lags the percentage against Brexit by five points – down from a four-point lead in August 2016. Have the wheels fallen off the Brexit bus? The UK never had a serious debate about what leaving the EU actually means and the choices available to the UK outside the single market. The Brexit negotiations have laid bare the exaggerated claims about the ease at which the UK could reshape its role in Europe and the world. Fresh appeals to sentimentalism by key Brexiteers such as MP Boris Johnson are now less effective than before. Since Mr. Johnson and ex-Brexit minister David Davis resigned from the Cabinet in early July, the proportion of voters who believe that Brexit was the wrong choice has risen to its highest level. Just how much “sovereignty” is optimal? Exercising its sovereignty, the UK has chosen to leave the EU. However, in an interdependent world, the UK has to agree the terms on which it interacts with other countries with its partners. The more it insists that these terms need to always and fully reflect its own preferences, the less scope it leaves for mutually beneficial exchanges with other countries. Looking at voters’ dissatisfaction with the current Brexit process suggests that voters may want a softer line on Brexit which leaves the UK more closely linked to the EU — even if that means that the UK has to accept more of the rules of the common market. That a majority of people polled now think Brexit was the wrong choice does not mean a new referendum would end with the UK voting to stay in the EU. The pro-EU lead is too slim to reliably predict the outcome. Most likely, voters will not be asked again as the Tories will keep the current government together and avoid a new vote. Only if snap elections yielded a Labour-led coalition (for which there is a 25% chance) may the new government table a new referendum. This is a long shot. There is no more than a 10% chance that Brexit will be reversed. 2. explain to voters the trade-offs involved in participating in multilateral trade agreements. In future trade deals with the EU or other nations, the UK will have to forfeit some capacity to decide the rules it applies to its markets. Until the options offered to UK voters reflect these realities, there is little chance that they will be happy with any Brexit outcome.